Marenco Beach & Rainforest Lodge is a Costarrican Hotel with a privately owned nature reserve and lodge located in what is probably Costa Rica's greatest natural endowment, the rain forest and scenic coastal regions and beaches of the Osa Peninsula. Marenco's breathtaking, exotic coastal location provides unlimited opportunities for adventure, family recreation, nature study, research and even some rest and relaxation, in one of the world's classic wilderness areas. The Lodge takes pride in being an eco-lodge in one of Costa Rica�s most remote and interesting regions in a safe and comfortable manner. 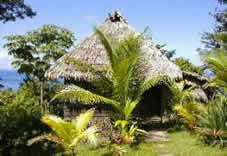 The Lodge offers 11 Bungalows, double and triple occupancy and 4 standard, single and double occupancy rooms. All rooms have shaded terrazas from which you may enjoy the splendid views of the jungle or the ocean. As the Lodge is located in a remote area, the electricity comes from a generator in the evenings and the water for showering is natural and fresh. You may find a restaurant on the property that offers delicious meals. The Lodge takes pride in being an eco-lodge in one of Costa Rica�s most remote and interesting regions in a safe and comfortable manner.